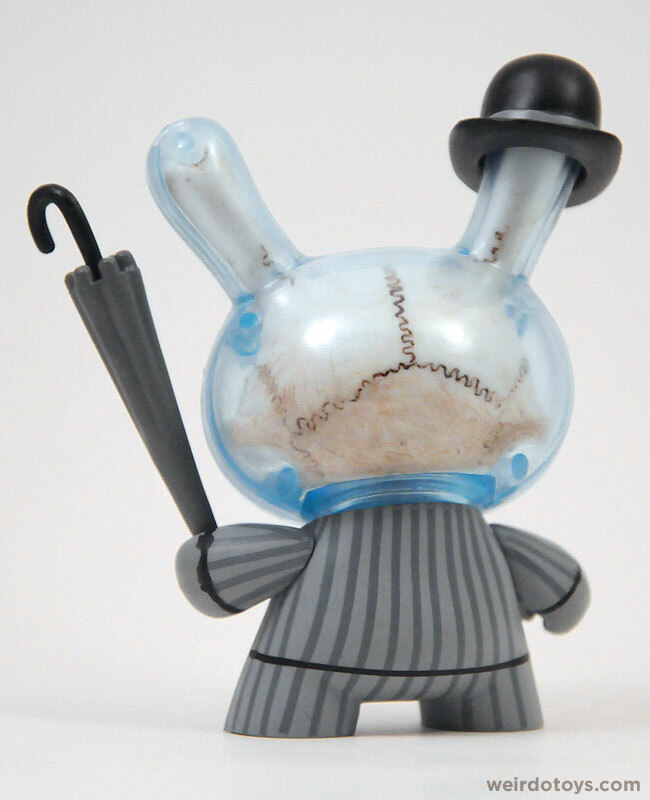 I’m not a die hard fan of Kidrobot’s Dunnys. I like ’em well enough. I buy some here and there (hoping to get some good ones), but overall, I’d consider myself a casual collector. 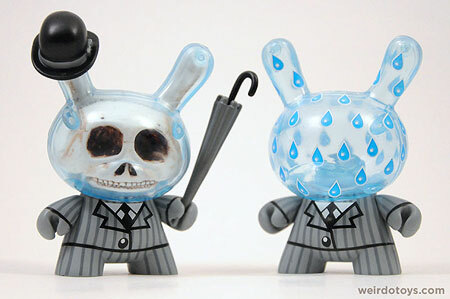 I’ve never paid collector’s prices for a Dunny, and I’ve never even considered buying a custom Dunny. And it was love at first site. What’s not to love? 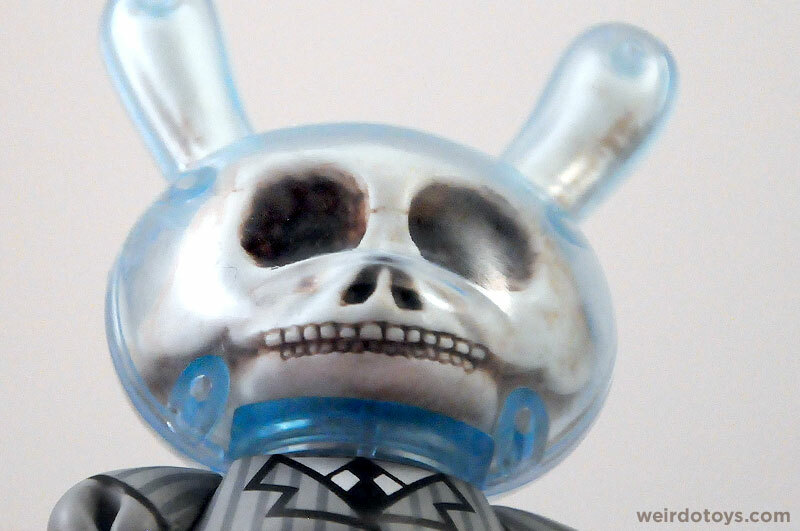 A visible skull in any toy is pretty cool… especially if it’s encased in a glass-bowl-helmet-thing. I think what tops it off for me is this guy’s suit, derby and umbrella. That’s one classy bone head. What I also love about the Dunny Skull is the attention to detail. The skull has the color and visual texture of real bone. A dark paint wash brings out the details, which includes all of the skull’s sutures, foramina and teeth, making it appear more “anatomically accurate.” Beautiful work! Well, there’s a 2-part answer. First of all, the Dunny figure itself is actually from the Ye Olde English Dunny Series. It’s “Rainy London” designed by Triclops Studio. It has a hollow, transparent head. 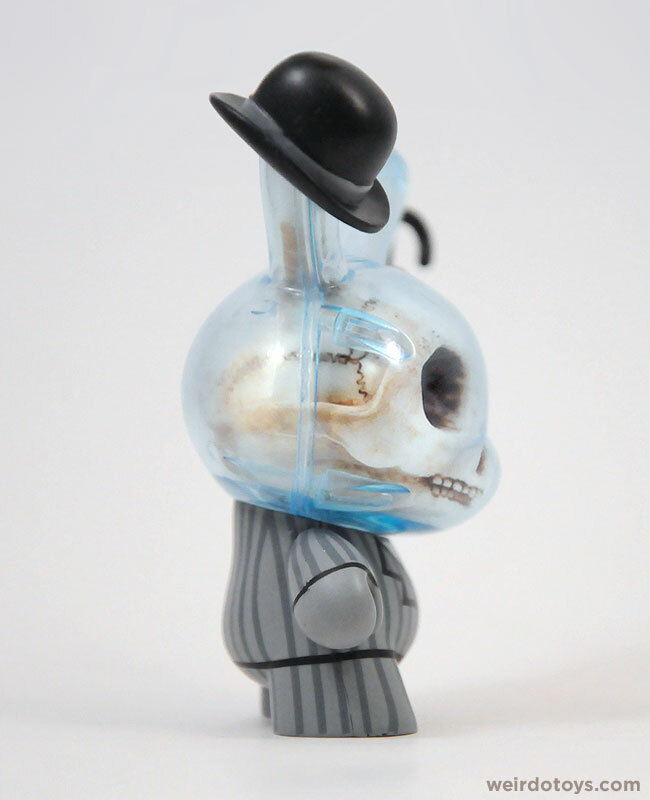 Secondly, artist and toy maker, George Gaspar (of Toy Break, and October Toys fame) decided to remove the paint from the head and fill it with a cool, miniature Dunny skull… transforming a “meh” Dunny into a “yeah!” Dunny. I discovered this little guy about a month ago through SpankyStokes.com. 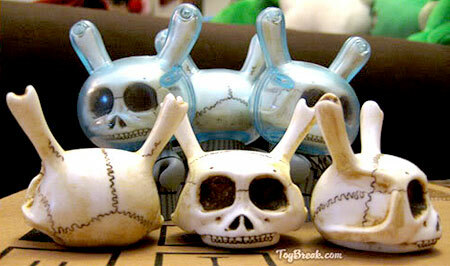 When they announced the custom, George had created a pretty small run of skulls. I think he’s making more custom skulls as fans demand them, so if you’re interested, you’ll have to send him a private message over at October Toys’ discussion board. with any toy that has a skeleton involved. “Apple Devil” etc. @WeirdoToys I am offended… but I shall read the post anyway 😉 Lunch Losers Unite! Hey this reminds me of a toy that i got about 2 years ago. I reallt think youd like it but i cant remember the name of the toy make. Lets just say its pretty weird. The one i have is a small little guy with a clear kinda belly and he has skin on his face that you can peel of to show his skull. If you are interested in him ill send you a email with pics of him. 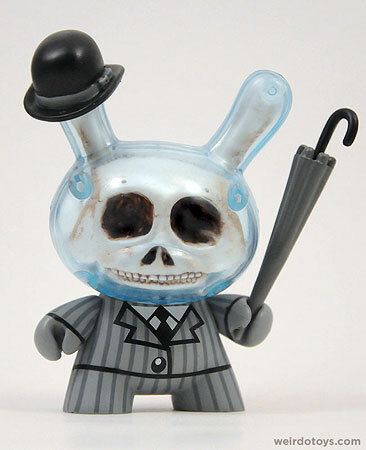 I’m not a HUGE Dunny fan, but this one is fantastic! Love the juxtaposition of realistic skull w/ cartoony simple Reminds me of that artist that did sculptures of cartoon characters’ skeletons. Too lazy to look him up right now. I agree. I’m still blown away! I managed to snag one of these before they sold out, and I have to say that it is THE best Dunny I own. George’s sculpting skill kicks so much tail it’s not even funny. The pictures of these things are great, but until you hold one in your hands you just can’t truly appreciate the intricate detail and care put into it. If he makes another run of these do NOT hesitate to snag one… or two! They are worth every penny! I know! I’ve told people that too. Seeing it in-person is so much cooler than any of my photos. I’m a part of the October Toys forums, and I didn’t hear about these guys until it was too late, it’s a damn shame, because it was the first custom I specifically wanted… I’ve asked if George plans to do another run of these with no answer, he was offering to piece together a few of them from the extra skulls he made if you bought the Dunny yourself, but I think all of the skulls were sold as-is. 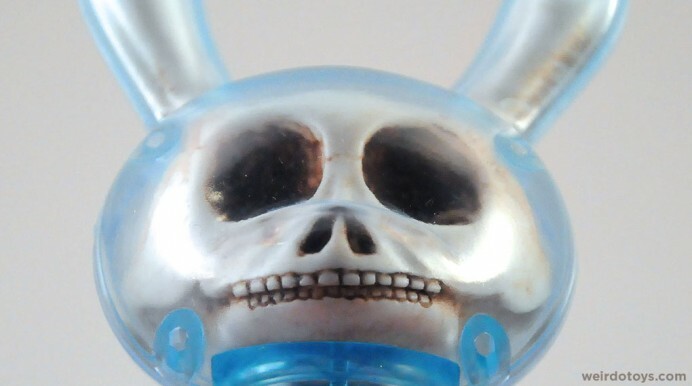 I actually knew about the name “Skull Dunny,” but since it’s not an original Dunny and just a variation of the Triclops design, I just wanted to refer to the Dunny’s skull. The look is awesome, and I’m glad someone was a little bit more creative with their dummy custom than just a straight repaint. It’s been done. This? It hasn’t been done, and that’s why it’s awesome and people are noticing. Thanks for sharing!